PayPal is one of the most popular methods used by businesses for processing payments. It makes it easy for new businesses to set up an account and begin taking credit card payments immediately. Unlike other payment processors, PayPal charges a percentage of each transaction. In addition, PayPal can terminate your account for a variety of reasons. Understanding how PayPal works and the alternatives that are available will protect your business from unwanted issues and loss of revenue. PayPal and similar services are known as merchant account aggregators. These work by creating a single merchant account that is shared by all of the platform’s users. This allows PayPal to minimize the risks associated with processing payments for a large number of businesses. Many businesses use PayPal as an alternative to other payment processing service providers. PayPal doesn’t charge monthly fees like other account providers; however it does charge alternerate fees that can quickly add up. For this and other reasons, Paypal is not an optimal choice for some businesses. Business owners who overlook the differences between PayPal and other merchant account providers can face serious issues down the line. PayPal’s unique model has a number of drawbacks. They allow businesses to create payment processing accounts quickly without obtaining much information about the types of businesses they’re serving. Credit and criminal background checks are overlooked, and PayPal has very little information about the products or services you sell, order fulfillment and delivery, or the likelihood of your long-term success as a merchant. When a significant issue occurs, PayPal’s main course of action is to freeze or terminate your account. 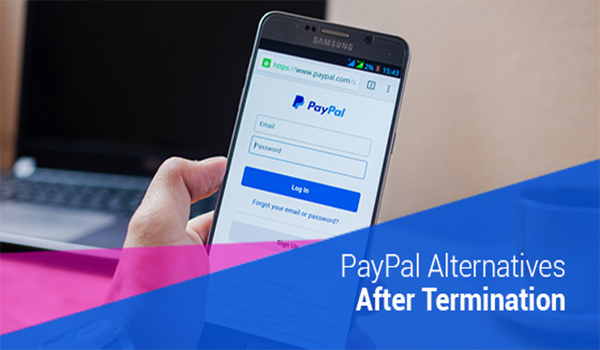 If your account has been terminated by PayPal for any reason, you need to know the available options so that you prevent unwanted disruptions to your business. Contrary to Paypal, A merchant account can be a cost-effective and reliable option for your business. It allows you to process payments made with major credit cards. A merchant account has many advantages when compared to PayPal and other aggregator services. PayPal requires you to transfer funds from your account to your bank whereas a merchant account places money directly into your bank account within a few days after a purchase is made. This prevents delays that can affect your daily operations and revenue tracking. Businesses that have a high number of transactions benefit from merchant accounts that charge one monthly fee. PayPal’s per-transaction fees can be costly if your business processes many purchases. Making a purchase through PayPal requires customers to leave your website thus significantly increasing your risk of shopping cart abandonment and the loss of the sale. When using a traditional merchant account, your payment is processed directly on your site. Another benefit is that your customers are more engaged, upselling is easier and conversion strategies are more effective. If your account has with Paypal has been terminated, and you are looking for a more cost-effective, efficient and secure solution, merchant accounts are your solution. Your business will be able to continue processing payments without the high fees of PayPal and other aggregator services.